I recently had the opportunity to participate in an exciting project to prototype tools that could improve the process of golf course design. 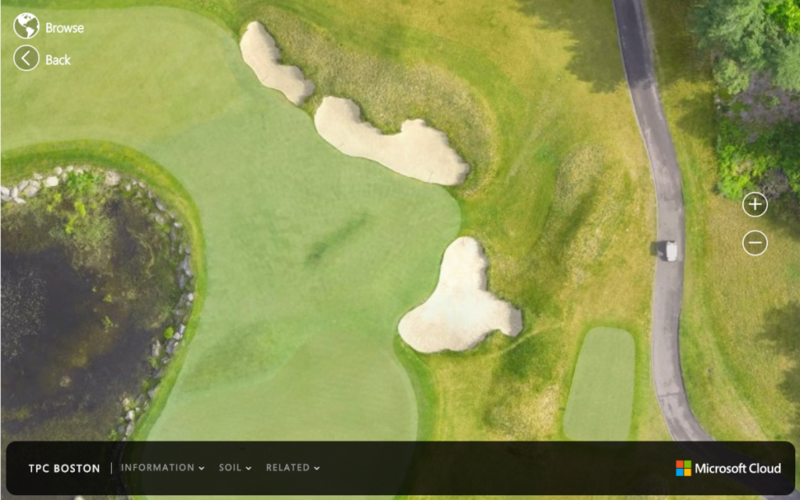 A large part of this effort was creating workflows and tooling for building high-resolution captures of golf courses before, during and after construction. Our goal was to surface as many data points as possible about existing and under construction courses to better inform the course architect during the design or renovation process. A major part of this data is accurate mapping and topographical data, so the first thing we did was haul our UAV’s around the country to map some golf courses. Courses were mapped with a set of 3D Robotics Solo drones using downward facing GoPro cameras taking 12-megapixel photos. The drones were flown in an autonomous mode using computer generated flight plans. The altitude was between 100ft and 160ft, determined by the height of trees and structures we would be flying over. This capture technique is easy to understand if you look at a visualization of a post-flight log. Here is our capture at Streamsong resort in Florida. Each red dot on this map represents a photo that was taken by one of the drones. I’ve pulled together 90 seconds of video taken during our drone capture in Streamsong and created a video that will give you a feel for the terrain. We took close to 10,000 photographs. Processing these gigabytes of photos is a very resource intensive process. First, we geotagged all of our photos by correlating GPS logs generated by the drones to time stamps on the photographs. Then we fed all of the photos into Pix4D Mapper to generate high-resolution 2D imagery and 3D mesh data. Pix4D gives us massive 2D maps reconstructed from the photos called orthomosaics. These are 3+GB tiff files which we processed using GDAL and uploaded to MapBox. This means we can allow extremely deep zoom on a map view to let users see amazing detail. The 3D mesh data generated from our captures was processed using our Pyrite3D framework to create a browser-based WebGL view of the datasets where the user can move around from hole to hole in the course and visualize the terrain. Quality is kept at a moderate level to ensure compatibility with a broad set of consumer devices. And note that we can display world coordinates on this map, so all course holes are automatically marked and users can easily navigate between them. This is a really neat project. How many courses did you fly and how did you convince the courses to participate in this project? We flew 4 clubs, each with several courses. They were all extremely happy to cooperate. Our partnership with the designer of many of the courses helped of course. I use Pix4D for a lot of projects. This is a great view and analytic implementation. Is this project something that can be made available to us? We would love to implement this for our customers data we collect and process. any chance you are looking at drotek’s RTK for your 3dr solo ? Im getting great results using a DJI. but wanting RTK for better results.